You can build an incubator for your eggs easy and cheap, however, you have to put in the work. Hatching eggs is a process that takes up to 21 days. Here are a few steps on how to build your own DIY Incubator for chicken. Paying attention to both humidity and temperature is mandatory. Incubating eggs leads to hatching. You need to be prepared for this procedure but, you need to build your incubator first. Find an old kitchen cabinet or an office cabinet, or anything that resembles something of that sort. The cabinet should be closed on all sides but for one, for easier monitoring and maintaining proper conditions for perfect hatching. In addition, if the cabinet doors are see-through, it will save you from a lot of trouble. Buy a thermometer or use the one you have. 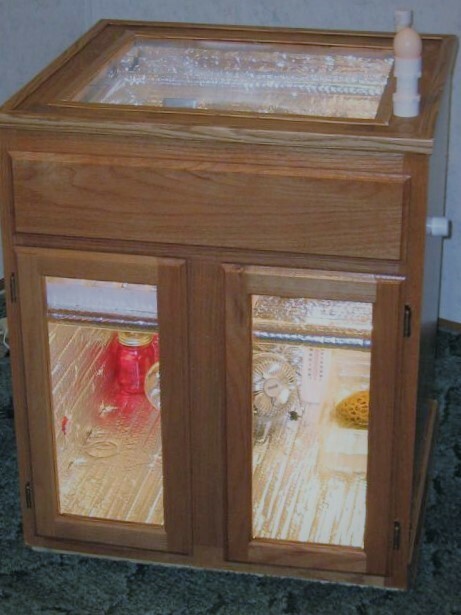 Use an old lamp or any lamp at home for lighting inside the incubator. The temperature must always move within a range of 35 to 40.5°C however never should go to either temperature extreme. By overheating the eggs, you might reduce the hatching ratio and speed up the process. Which is never good. For the eggs to hatch, the ideal humidity must be 50-55 % (28-31 degrees) in the first 18 days and the last 3 days should be no more than 65 % (31-32 degrees.) Be careful not to dry out the eggs. You will need to turn the eggs on each side daily, so mark them with a different symbol on each side. It’s easier to figure out if you have already turned them. Do not forget the ventilation, install a P fan (cooler) or a regular fan, you can get this at a flea market or IT store. Air circulation is crucial for a successful eggs incubation. Everybody loves a fresh breeze of air even if you are new hatched out of an egg. Next Article Raising Chickens 101: Could You? Would You? Should You?